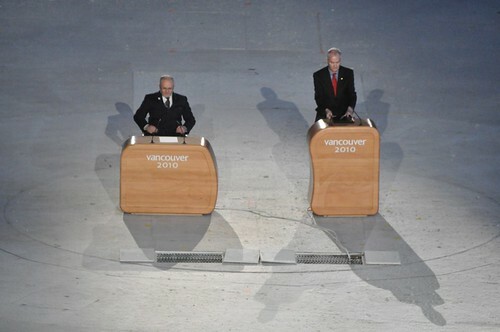 The year started off preparing for the Vancouver 2010 Olympics. Seeing 2010 on the calendar suddenly made it all a reality and the mad rush to get organized and a site up and filled with content began about a month before the Games actually opened. I was very lucky to have had the opportunity to work with an amazing group of talented folks who teamed up to create the VancouverAccess2010 website. With BCIMC accreditation, we focussed on the fan’s view of the Games and the team of us set out to attend as many events as we possibly could. 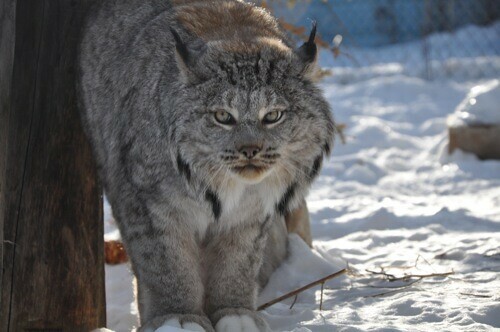 We photographed and reported on them via this great resource site that we collectively created. Posts were also featured on Canada.com’s VanFans2010 blog. 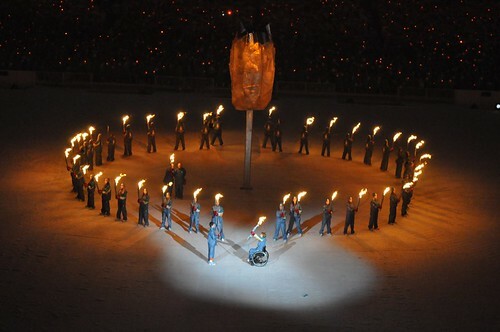 The Paralympics was an even more amazing experience for me. With IPC photographer accreditaion, I was able to get up close and personal to shoot the amazing athletes and their inspiring performances in sports ranging from from sledge hockey, to sit skiing, to vision impaired downhill skiing, to curling, to incredibly emotional medal ceremonies! Unbelievable! 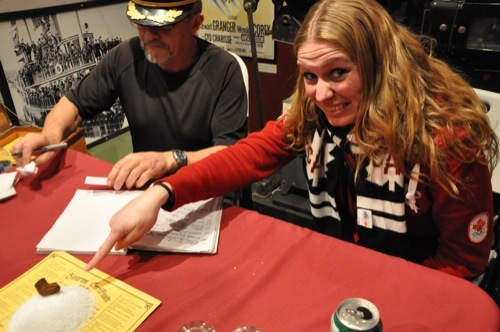 During the Games, I was invited to join a media day trip to Whitehorse, Yukon. Yep, that’s right, a DAY trip to Whitehorse! It was crazy! Caught a 7am flight, toured Whitehorse, met a 2006 silver medalist Olympian, visited a nature reserve, tasted coffee from a local eco-friendly coffee roasting shop, soaked in some hot springs, drank a Sour Toe Cocktail, and enjoyed a banquet dinner celebrating the annual dog sledding racers. The Yukon is such a beautiful part of our country! I would love to head up there for some summer camping to see what’s under all that snow! I imagine it to be absolutely breathtaking! Another amazing adventurous experience! So, in March, I flew to Austin Texas to shoot a wedding for a friend who was unable to make it, due to a car accident. Never having met the bride or groom, nor having ever spoken to them directly, it was an interesting experience. The couple were amazingly welcoming and we got along instantly. I am happy to now call them friends. Their jewish wedding was held in Houston, so there was a bit of a road trip mixed into the trip (and of course some tasty Texan BBQ!). Unfortunately, there was not much time for site seeing with the short timeline, but I hope to make it back to Texas to see and photograph more of it! Less than 2 weeks after returning from Austin, I was in flight yet again! This time for a month long adventure to Bali, Indonesia! Wow! It was an amazing month full of culture, food, site seeing, crazy drivers and photography! 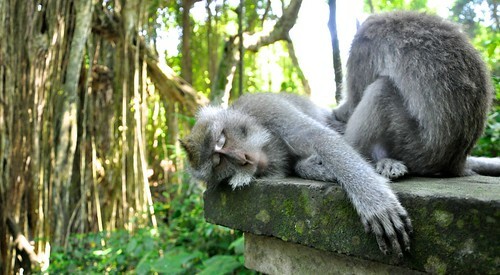 I spent the majority of my time on the northern side of the Island in Lovina. 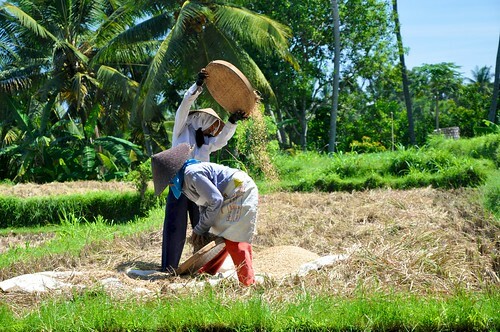 I spent about a week in Ubud as well. 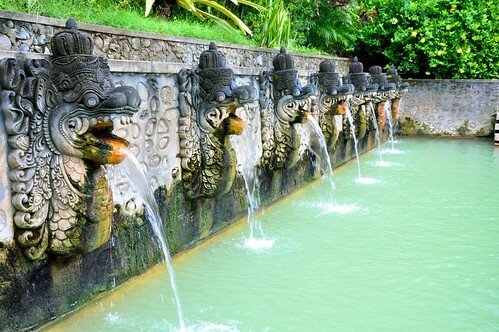 My trip to Ubud included a motorcycle adventure through the rice paddies, a walk through the Monkey Forest, a cooking class, and a Kecak and Fire Dance performance. It was an amazing month indeed, and I came home with gigabytes photos of the trip which can be viewed on Flickr. 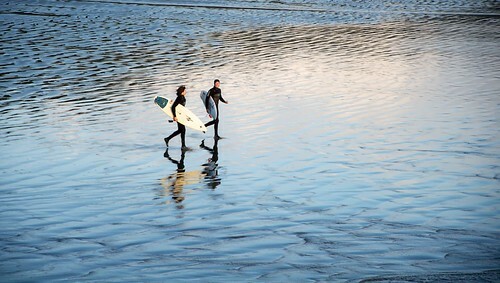 Upon returning to Vancouver, mid-May, the city was gearing up for summer. I was excited to do as much camping and music festival-ing as I could! 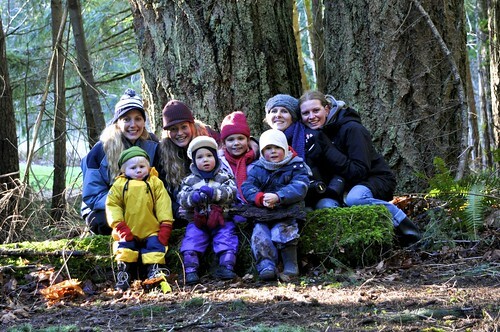 The first camping trip of the season was the first weekend in June, at Golden Ears Park. Always awesome camping there, one of my favourite provincial parks! No cell phone service, great hikes, campfires and of course tasty camping food (and drink)! 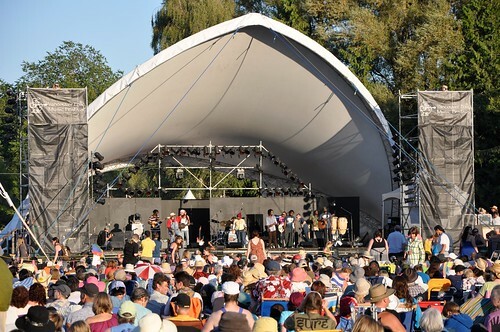 My first music festival of the summer was the Vancouver folk fest. I was fortunate enough to get 2 free Lifetimer, all-access passes to the festival from a friend who was unable to use them (thanks Lulu!) 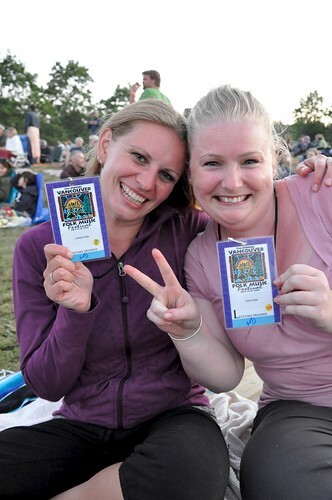 and me and a friend enjoyed a weekend of music, sun and family atmosphere at the beach! 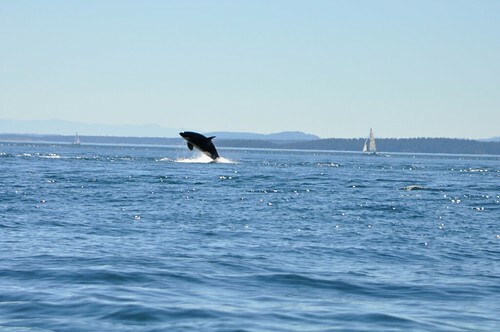 Next on the list was a whale watching adventure with my family out of Cowichan Bay on Vancouver Island with Ocean Ecoventures Whale Watching. Again, amazing! You will find a full summary of the adventure in this blog post. Komasket Music Festival in Vernon, during the August long weekend, was the next road trip. Teaming up with @Scales and @Uncleweed for some social media coverage of the event was great fun! 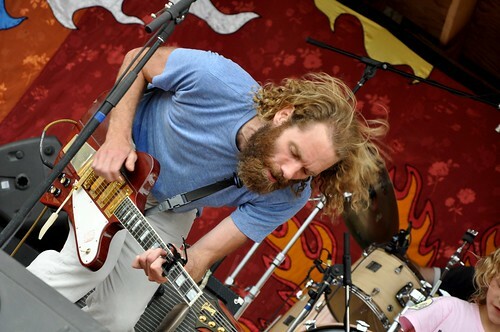 Got some great shots, met some great artists (including Fred Penner and the Wailers), and as with most summer music festivals, came home with a sun burn! 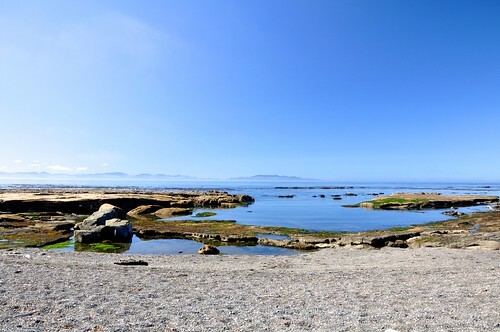 Later in August, I took a week long trip to my home town of Duncan, on Vancouver Island to spend my birthday with family and friends. 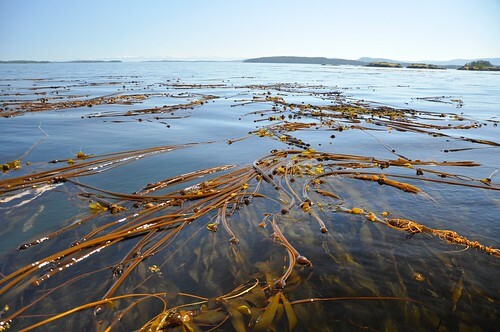 Good times had by all with boating/tubing on Lake Cowichan, and floating in the Cowichan River, a day trip to Port Renfrew and Botanical Beach, and no Island visit in summer would be complete without a fresh local crab fest! The perfect birthday it was! In the fall, things finally wound down a bit. 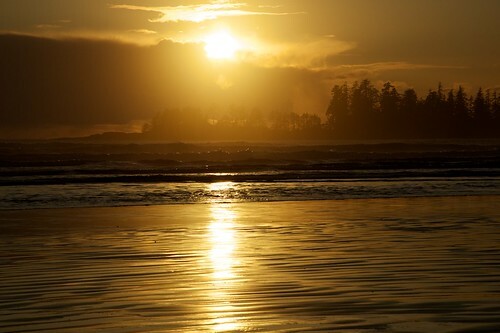 The last trip of the year was one out to Ucluelet and Tofino, on the West Coast of Vancouver Island. I had not been out this way since I was about 12 years old, so I was very excited to go enjoy and photograph the beaches, especially with storm season just setting in! I was not disappinted! We lucked out with beautiful sunny weather the first day, including a gorgeous sunset on Long Beach. 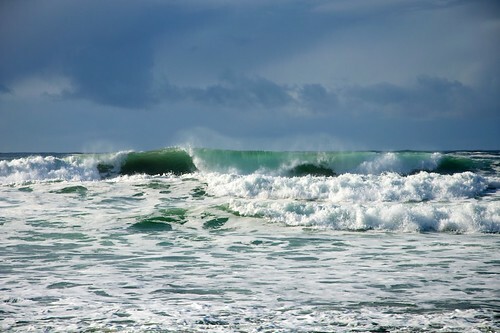 And the next day we enjoyed a storm and some great big crashing waves on the rocks in Ucluelet. And of course no trip to Tofino would be complete without a stop at Cathedral Grove and Coombs to see the goats on the roof on the way back! In the fall things became quite busy. I moved out of the downtown core at the end of September, to East Van. Although I have always had a dog on a part time basis, in November Roxie came to stay with me full time as @Scales departed for Thailand. I love having her and love that she gets me out rain or shine (or snow!) for two hour-long walks a day! Having started a fulltime position at 80 Elements Entertainment in October, I have fallen back into a full time job routine. Also, I have been shooting weekend events for Estee Lauder. I started doing Bikrams Yoga three times a week in November, which I have become ridiculously addicted to. So the end of the year has found me to be quite busy. I was happy to spend Christmas on the Island with family and friends and will be spending New Years Even there as well to ring in another (hopefully) adventurous year full of travel and surprises! My new years resolutions are these: Travel more. Photograph more. Build my photography kit. Learn more about social media. Do more Bikrams! More is MORE! Cheers to 2010 and all of you that I have met and befriended in the past 365 days! You have made an impact, and (whether good or bad) you have helped shape who I am and who I am to become. I thank you and look forward to another amazing year in 2011! 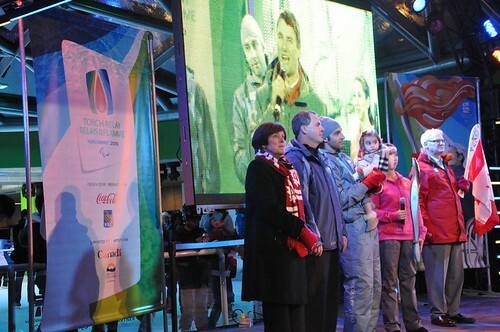 Vancouver 2010 Paralympics sit skiing medals ceremony in Whistler. 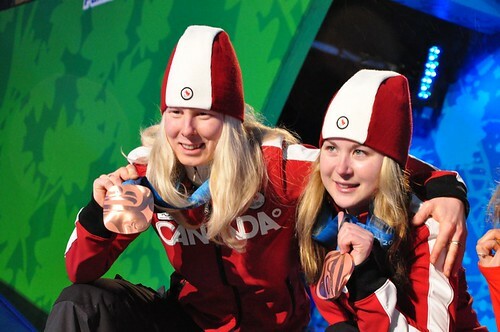 For more images from the medals ceremony, please visit the Set on Flickr. The Canadian Paralympic Sledge Hockey Team warming up for the Bronze Medal game at the Vancouver 2010 Paralympic Winter Games! For more images, please visit the Set on Flickr! 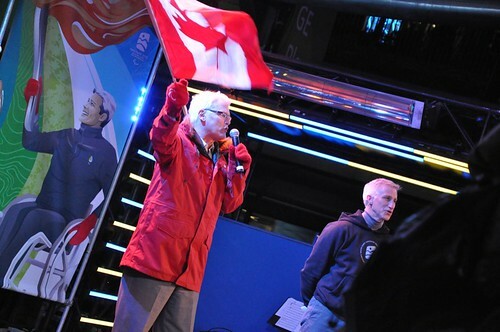 Canadian Olympic Committee Receives Funding of $5M Annually for 5 Years! Ottawa, ON (October 22, 2010) – Today, the Canadian Paralympic Committee and several decorated Paralympians gratefully accepted the financial contribution of $5M annually over the next five years from the Minister of State for Sport, the Honourable Gary Lunn. 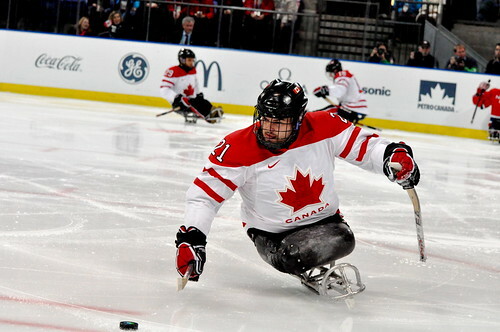 The funding was announced during the 2010 Canadian Paralympic Congress in Ottawa, attended by leaders in sport and disability organizations from across the country. This announcement follows the financial commitment announced by Minister Flaherty in the Federal Budget on March 4th. This funding represents a new era for the Canadian Paralympic Committee and leads the organization to a new and brighter future. With significant, stable funding, more children with disabilities will have the opportunity to participate in sport and pursue dreams of representing their country in international high performance competition. The result will be a positive impact on the health and well-being of Canadians, especially those with a disability. The new Strategic Plan will focus on four pillars: (1) enhancing podium performances at Paralympic Games; (2) building a World-class Paralympic Sport System; (3) creating a sustainable business model for the Canadian Paralympic Committee; and, (4) expanding the awareness of Paralympic sport and building the Paralympic Brand. “The Federal Government’s commitment represents a new era for the Paralympic Movement in Canada,” said Chantal Petitclerc, five-time Paralympic wheelchair racer and winner of 21 Paralympic medals. “It is very encouraging to see that up and coming athletes will have this type of support from their Government and I am thrilled to see Paralympic sport receive this kind of recognition. September 15, 2010 (Ottawa) – September 18th marks the first-ever Sports Day in Canada and the Canadian Paralympic Committee and its members are proud to invite Canadians to experience first-hand various Paralympic sports during hands-on sport demonstrations in Ottawa (ON) and Richmond (BC). With only 3% of people with disabilities physically active, this event will bring attention to the importance of sport in the lives of all Canadians, especially those with a physical disability. 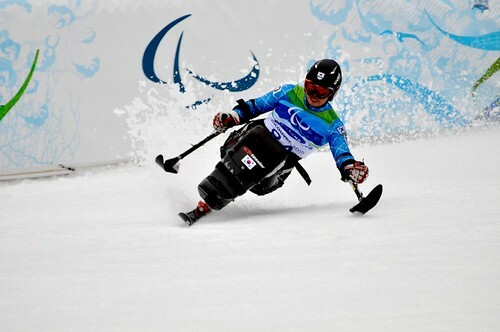 In partnership with many sports organizations, Canadians of all ages and abilities will have the unique opportunity to get active and join Paralympians in a wide variety of Paralympic sports while celebrating this national landmark event – Sports Day in Canada – and raising the awareness of the benefits of participating in sport. On September 18th, the public is invited to experience goalball, para-athletics, wheelchair basketball and many other sports alongside Canada’s Paralympians! In addition, other sport representatives will be onsite to provide instruction to Canadians of all ages and abilities to experience Paralympic sports. As the University of Ottawa Gee-Gees compete against the McMaster Marauders in an exciting homecoming game, Paralympians from athletics, wheelchair basketball, sledge hockey, and many more sports will be on site, demonstrating their sports and teaching Canadians how to play! WANT TO KNOW MORE ABOUT SPORTS DAY? Sports Day in Canada is a national celebration of sport, from grassroots to high-performance levels, in communities across Canada. Sports Day in Canada caps off a week of thousands of local sporting events and activities, open houses and try-it days showcasing sport at all levels, and includes a special television broadcast on CBC Sports. 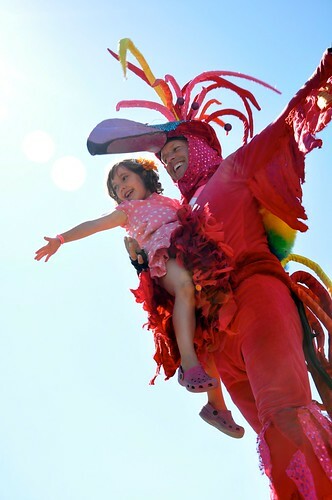 Sports Day in Canada is presented by CBC Sports, ParticipACTION and True Sport and is guided by a committee of national sporting organizations including the Canadian Paralympic Committee (CPC). The Canadian Paralympic Committee (CPC) is pleased to announce that Dr. Gaétan Tardif has been named Chef de Mission for Team Canada at the London 2012 Paralympic Games. 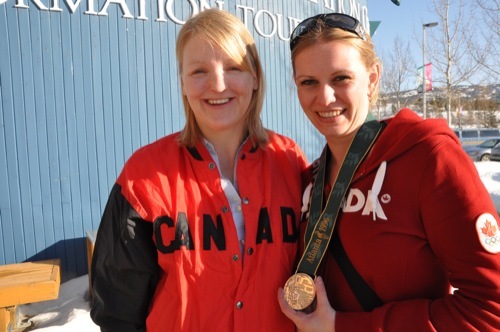 Dr. Tardif is a dedicated long-time volunteer within the Paralympic Movement. He first became involved during the Sydney 2000 Paralympic Games as a member of the Canadian medical team and has been part of the 6 consecutive Mission Staff Teams for all subsequent Games, making London his 7th Games. Dr. Tardif is Vice?President Quality, Patient Care and Chief Medical Officer at the Toronto Rehabilitation Institute. He is also a Professor in the Department of Medicine and Director, Division of Physiatry (Physicial Medicine & Rehabilitation), at the University of Toronto. 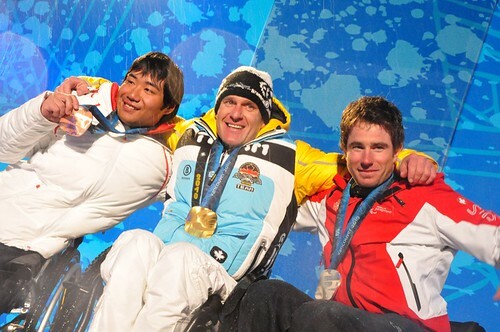 Dr. Tardif has extensive experience at the Paralympic Games as he was part of the medical team for the Sydney 2000 and Athens 2004 Paralympics, as well as Chief Medical Officer for the Salt Lake City 2002 and Torino 2006 Paralympic Games. 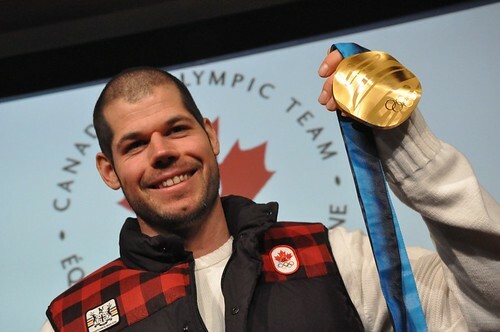 Most recently he served as Assistant Chef de Mission for the Beijing 2008 and Vancouver 2010 Paralympic Games, where Canada achieved its best ever performance. He is also a member of the Board of Directors with the Canadian Paralympic Committee as Director of Administration, a role he has had since 2008. The Chef de Mission is responsible for helping Canadian Paralympic athletes achieve their performance goals by acting as the official representative and spokesperson for the Canadian Paralympic Team. In this role Dr. Tardif will oversee the Canadian Team’s operational planning and logistics, promote the exploits of Canada’s elite Paralympic summer athletes, and raise awareness of Paralympic sport and the Canadian Team across the country and around the world. 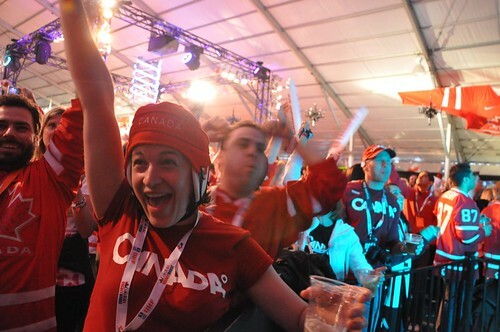 The Chef de Mission will lead team building initiatives for the Canadian Paralympic Team volunteer mission staff to create a strong and cohesive support team for Canadian athletes at the Paralympic Games. Dr. Tardif’s initial key priorities as Chef de Mission include an initial visit to the London 2012 Summer Paralympic Games site, selecting the Assistant Chef de Mission and key volunteer Mission Staff, and meeting regularly with athletes and coaches to understand their needs and provide them the support and services they need to succeed. Dr. Tardif was born in Saguenay, Quebec, and completed his medical degree at l’Université Laval and has obtained specialty certifications in Quebec, Canada and the USA following his residency training at the University of Ottawa. He subsequently obtained a diploma in Electrodiagnostic Medicine from the American Board of Electrodiagnostic Medicine as well as a diploma in Sports Medicine from the Canadian Academy of Sports Medicine. Dr. Tardif also has a keen interest in physician leadership development and was recently appointed to the Faculty of the Physician Leadership Institute of the Canadian Medical Association. He also became President of the Canadian Society of Physician Executives (CSPE) in April 2009. 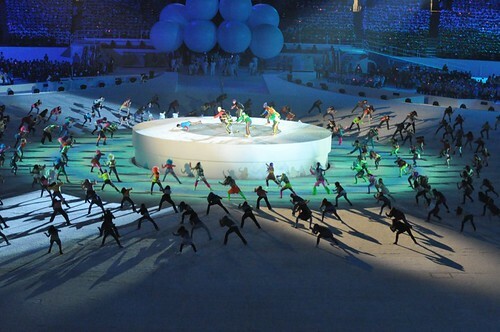 The London 2012 Paralympic Games will take place August 29 to September 9, 2012. For more information about the Canadian Paralympics Committee and the Canadian Paralympic Team, please visit http://www.paralympic.ca. 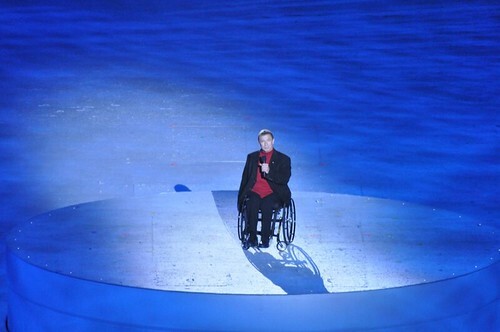 On March 12th, the 2010 Paralympic Opening Ceremonies took place at BC Place in Vancouver, BC. This was an absolutely amazing and inspiring event and I was very lucky to have had the opportunity to experience it from several photographer positions in the stadium, due to my official VANOC media accreditation. It was an amazing sight to walk into the stadium and see the stadium filled with people wearing the colored ponchos assigned to their seats. 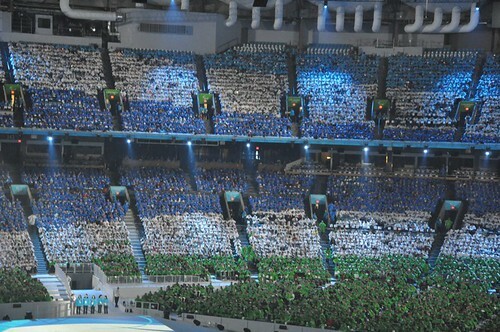 Blue, green and white flooded the stands in the shape of the Paralympic logo. Awesome! 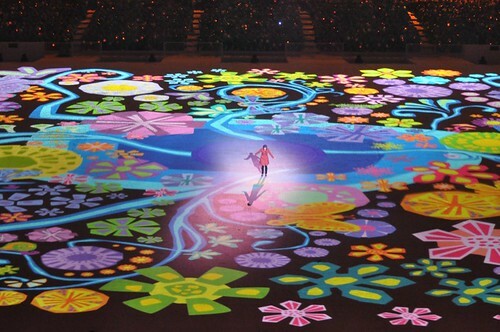 The Opening Ceremony was an amazing show with some incredible talent from the disabled community. 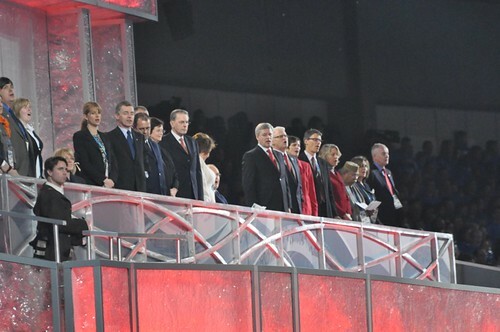 The Ceremonies started with the introduction of the esteemed guests, including Prime Minister Harper, Premier Gordon Campbell, VANOC CEO John Furlong, and Paralympics President Philip Craven, among members of the four host nations and others. The inspiring speakers of the event: VANOC CEO, John Furlong, IPC President, Philip Craven and Rick Hansen of the Rick Hansen Foundation and the Man in Motion World Tour. 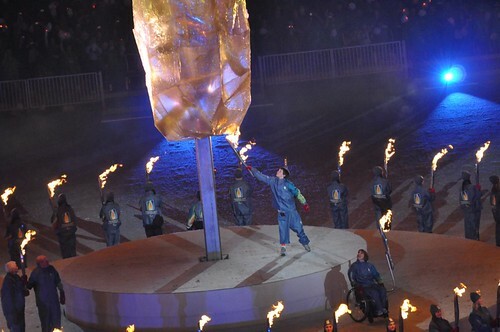 And, of course, the lighting of the Paralympic Cauldron. The torch was brought in by the parents of Terry Fox, Betty and Rolly Fox, A truly emotional and inspiring moment to experience in person. 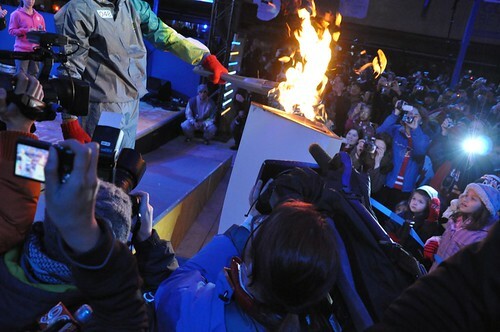 It was passed off to other torch bearers before the final 15 year old torch bearer Zach Beaumont, lit the cauldron. 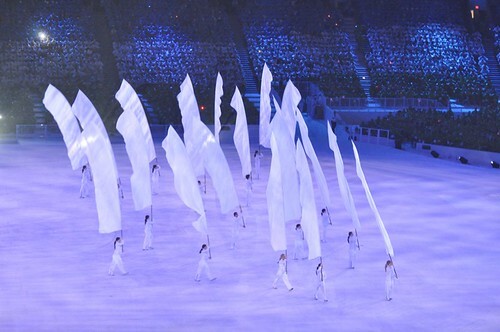 With the theme of One Inspires Many, the Paralympic Opening Ceremony was definitely inspiring. 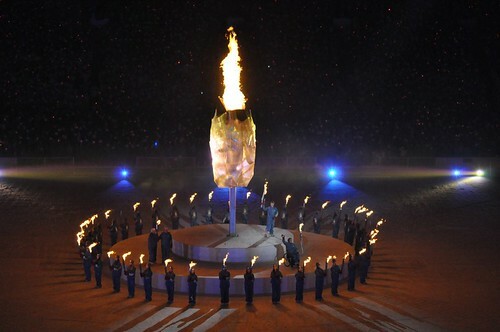 Good luck to all the athletes competing in the Games! It will be an amazing 10 days! 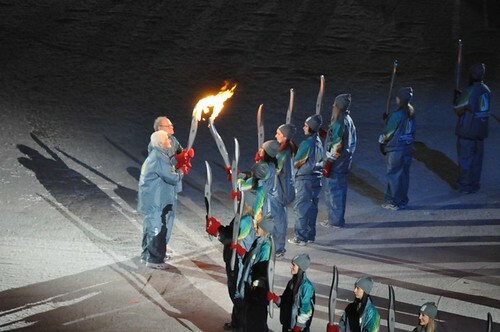 For more images of the Opening Ceremonies, please visit the set on Flickr! 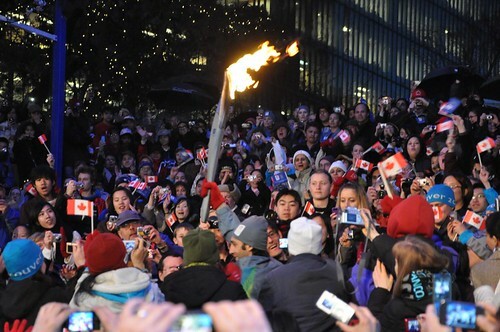 You could feel that Olympic energy returning to Robson Square last night with the torch relay coming through, carried by Roberto Luongo. Hoping to see the fans just as excited during the Paralympic Games over the next ten days in support of the amazing athletes and the additional challenges they face in order to compete in this amazing event. The crowd gets hyped for Roberto Luongo’s arrival. 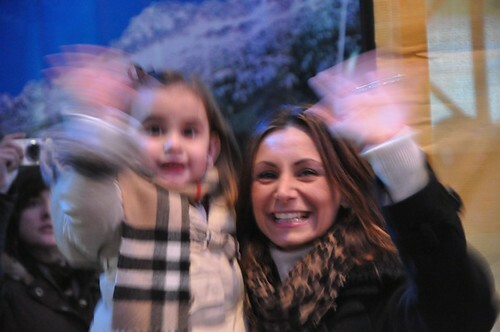 Luongo’s family, excited to see him. 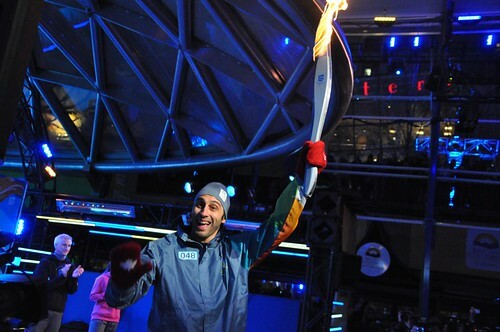 The lighting of the cauldron. Passing the torch to the next 24 hour relay torch bearer. Gabriela Luongo joined her father on stage. 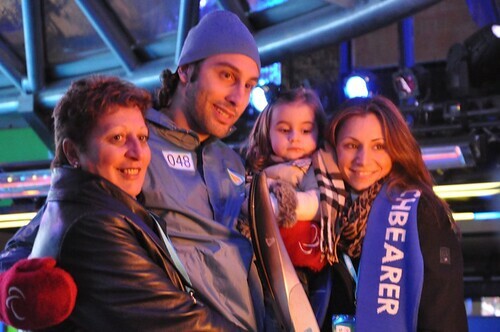 Gold medal winner, Roberto Luongo with his family. Post torch even interview. Luong speaks about his gold medal (he showed it to Ryan Kessler first! 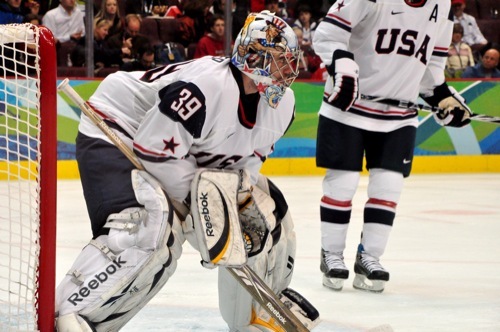 ), the paralympics, the sledge hockey team and how the Olympics affected his NHL game. 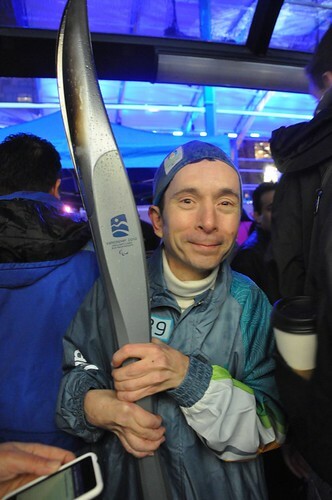 After all the Luongo excitement was over, I was excited to meet one of the day’s torch bearers. 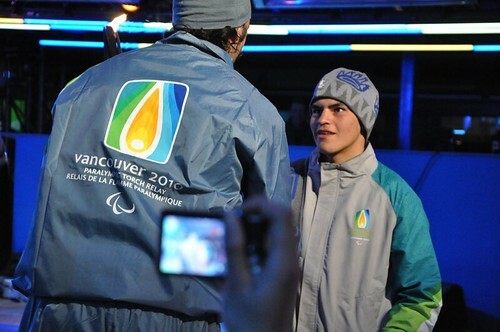 He told me all about riding on the bus with Roberto Luongo that day and how excited he was about having the honour of carrying the torch. 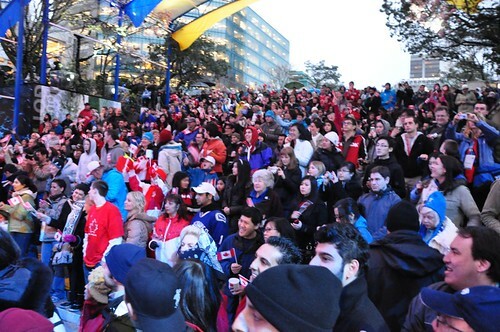 For more photos from the Robson Square event, please visit my flickr page. Here it is! 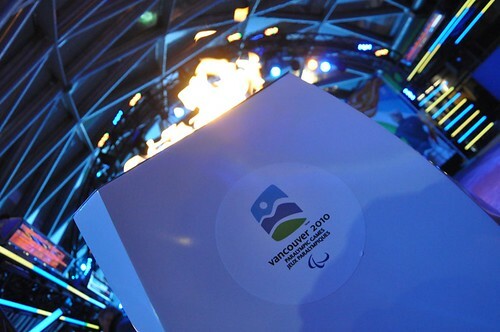 I was approved to receive VANOC media accreditation for the 2010 Paralympic Games! I am very excited to have this opportunity to photograph the amazing athletes participating in the Paralympics and cheer them on in their respective sports! 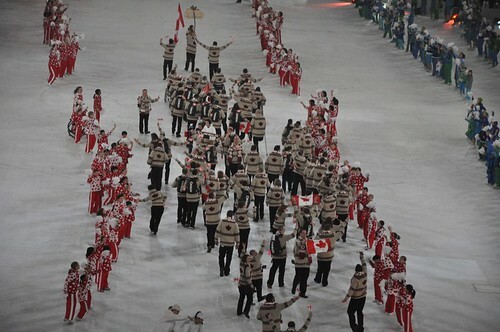 Go Canada GO!!! I’m aiming to go to and photograph at least one Paralympics event each day of the Games, so check back here and my Flickr account often!